When it comes to retirement accounts, the options can be overwhelming. Each has its pros and cons, unique opportunities, and various fees. Today, I will cover the elusive Roth 401(k), with which many employees, professionals, and investors aren’t familiar, and the role it can play in someone’s retirement strategies. In the most basic terms, a Roth 401(k) is an employer-sponsored retirement savings plan — like your traditional 401(k). However unlike your traditional 401(k), you fund it with after-tax dollars instead of pre-tax dollars. Like a 401(k), an employer-sponsored Roth 401(k) plan enables you to defer up to $18,000 of your salary per year (or $24,000 if you are age 50 or older due to the catch-up provision). Your funds grow tax-free for retirement and you won’t pay taxes when you start taking distributions as long as the withdrawal is a qualified distribution. Remember that you pay taxes up front with a Roth 401(k), which means you will contribute money from your paycheck after it is taxed. However, once it’s in the account, your money grows tax-sheltered and your qualified withdrawals are tax-free. There are several rules when it comes to taking qualified distributions from your Roth 401(k). When it comes time to retire, you can start taking distributions without penalties as early as age 59 ½ or if you’ve experienced a disability. If the account owner passes away, funds can be withdrawn by the beneficiaries. You must also have had your account for at least five years to withdraw from the account or you’ll be required to pay taxes on the gains. Like most other retirement accounts, you are required to start taking distributions no later than the age 70 ½ unless you are still employed and not a 5% owner of the business. One of the biggest benefits of a Roth 401(k) is that you can contribute to a retirement account that provides tax-free income regardless of your adjusted gross income. As there aren’t income limitations on Roth 401(k) contributions, higher income earners can invest in a Roth 401(k) to earn tax free income rather than contribute to and convert a traditional IRA into a Roth IRA. 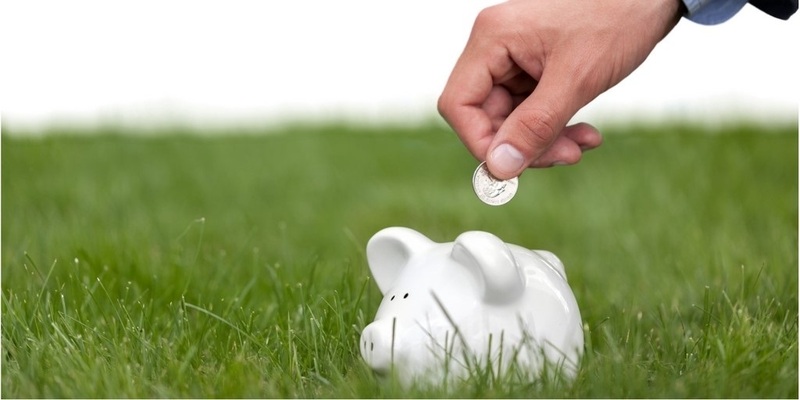 This can make a Roth 401(k) a good option for an individual who doesn’t qualify for a Roth IRA but would like to generate a tax-free retirement income. Additionally, with a Roth 401(k), you can also contribute to a traditional 401(k). Each year, as of 2017, you can contribute $18,000 to your 401(k), a Roth 401(k), or a combination of the two. Should I Invest in a Roth 401(k)? Unfortunately, there isn’t a blanket response I can provide, as everyone’s needs and circumstances vary. However, here are a few reasons why someone may choose to invest in a Roth 401(k). If you’re young in your career, you may benefit from investing in a Roth 401(k) because you’ll enjoy a number of years of tax-free growth. Additionally, if you anticipate being in a higher tax bracket when you reach retirement, a Roth 401(k) can make sense. You’ll be paying taxes up front based on your income now, rather than when you’re older, at a time when tax rates may potentially be higher – the highest federal tax rate peaked at 94 percent in 1944! However, there are times when a traditional 401(k) can be a better option than a Roth 401(k). Depending on your situation, contributing to a traditional 401(k) with pre-tax dollars may lower your adjusted gross income, which may enable you to qualify for a Roth IRA and make contributions. In utilizing this strategy, you would be able to contribute up to $18,000 in your 401(k) and an additional $5,500 to the Roth IRA. Additionally, if you anticipate your tax rate being lower when you retire than it is now, a traditional 401(k) could make more sense, as you’ll avoid having to pay taxes on your contributions now when your tax rate is higher. Should you invest in a Roth 401(k), traditional, or both? 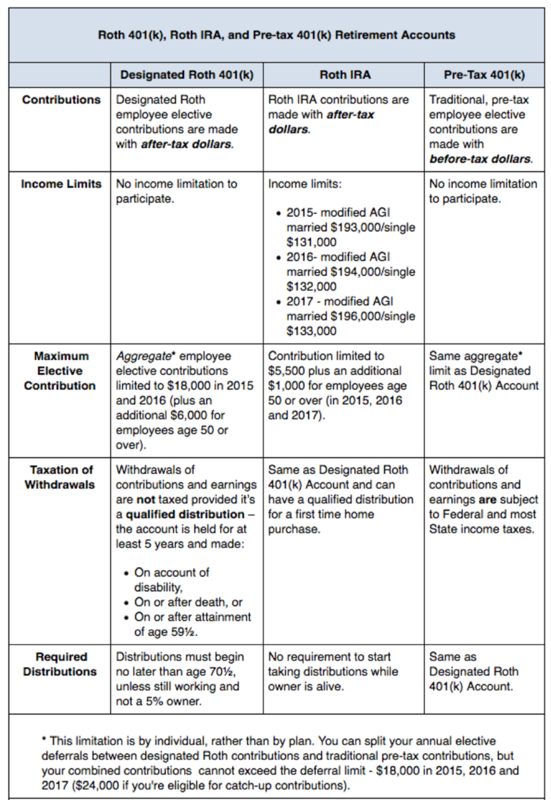 Are you eligible for a Roth IRA? Should you rollover a past 401(k)? There are a lot of questions to address when you’re planning for retirement. If you’d like to discuss some of these questions further, I’d be happy to help you review your options to determine which is most appropriate for your goals and situation. 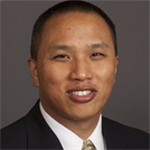 To set up a meeting, call my office at (949) 221-8105 x 2128, or email me at [email protected].